The two men at the helm of the Senate Sergeant-at-Arms office first crossed paths nearly two decades ago as staffers on the chamber’s Appropriations Committee. 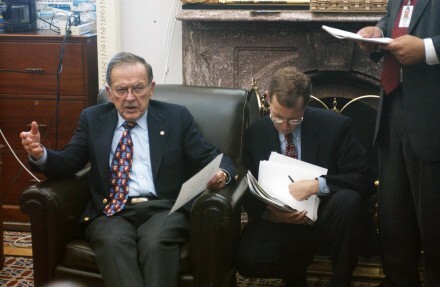 In 1997, freshly-minted SAA Frank J. Larkin began a congressional fellowship with the subcommittee in charge of Treasury Department funding, bringing his unique perspective as a Secret Service agent and former Navy SEAL to the turbulent and often arcane process of crafting appropriations bills. That same year, new Deputy SAA James W. Morhard was named staff director of what is now the Commerce, Justice, Science and Related Agencies Appropriations Subcommittee. For Larkin, the two-year fellowship provided a sense of the culture of Capitol Hill, a departure from the dynamics of the executive branch. He developed friendships with staffers, maintained over the course of a 22-year Secret Service career spent protecting presidents and United Nations dignitaries, followed by stints in the private sector and Department of Defense. Morhard, seated to his right during the interview, has the more familiar mug around the halls of Congress. In his second job out of college, he advised then-Sen. Pete Wilson, R-Calif., on the Armed Services Committee. The seasoned GOP aide worked for nine senators over the course of his 22-year career, rising to the ranks to become chief of staff for the Senate Appropriations Committee in 2003. “He’s got all the T-shirts from up here," Larkin joked in his first week as the Senate’s 40th Sergeant-at-Arms. “There’s not a place that we go in this building that he doesn’t know somebody, so that&apos;s a great asset to have." The team assembled by Majority Leader Mitch McConnell, R-Ky., plans to operate the 800-person office responsible for supporting and protecting the chamber under a similar setup as the duo put in place by Harry Reid, D-Nev., in 2007. When Terrance W. Gainer was appointed the Senate’s top law enforcement officer after nearly four years as Capitol Police chief, he gravitated toward security and protocol matters. Deputy SAA Drew Willison, previously an Appropriations aide for Reid, focused on day-to-day administration. “I’ll be pointed a lot to the outside responsibilities of the interagency relationships, building that connective tissue,” Larkin said, explaining that he would work closely with House Sergeant-at-Arms Paul D. Irving and the Capitol Police Board to safeguard the campus. Morhard will run the business side — technology and office equipment, mail processing and additional support services that fall under House Chief Administrative Officer Ed Cassidy on the other side of the Capitol. However, Morhard’s legislative career includes a portfolio of anti-terror work. He reported to then-Sen. Judd Gregg, R-N.H., “one of the smartest senators I’ve ever come across,” he said. Gregg instructed him: “I know you’re going to take care of this [Commerce, Science, Justice] bill, but you take the Justice Department piece of this and you do everything you can to prepare the United States for a terrorist attack,” Morhard said. Morhard began focusing on first responders prior to 9/11, when he said many bureaucracies weren’t really interested in helping the concept move forward. He oversaw terror response grant programs to equip and train state and local law enforcement, fire departments and county administrators. “There’s an old line — ‘the ills of society are rarely corrected by federal legislation,’ — so I’m not saying we saved the day or anything, but we certainly made every effort to try to do what we could before 9/11,” Morhard said, describing a program to get Cabinet-level officials involved in terror response exercises. On Sept. 11, 2001, Morhard was in the Capitol’s ornate, vaulted Brumidi Corridor. Larkin experienced the attacks from Ground Zero, as supervisor in the Secret Service’s New York Field Office located in the World Trade Center. Larkin scrambled, seeking shelter under the front half of a firetruck. When the air cleared later that afternoon, he realized the back half of the truck had been crushed during the collapse. “I was wearing a suit just like this, maybe lighter,” Larkin said. His wife sent the suit to the cleaners, and when passing by a window to rehang the jacket noticed “hundreds of slits” from the impact. Larkin was initially reported missing, and suffered respiratory injuries, coughing up blood during the three months he spent leading recovery efforts before being transferred back to Washington. Morhard had a harrowing near-death experience in 2010, chronicled by Washington Post Magazine , as a passenger on then-Sen. Ted Stevens’ plane. He narrowly survived a crash in the mountains of Alaska that killed the Republican senator and four others. “I knew right then that’s why I worked so hard to get to those funerals,” he said. McConnell and his wife, former Labor Secretary Elaine Chao, visited Morhard in the hospital before when they arrived for Stevens’ funeral. “As much as you know the outer persona, there is a warmness to this man that people don’t see,” Morhard said, recalling how the couple sat with him and held his hand. "You never forget,” he said. "And, you know, I hope I can give back — as Frank does, too — to this place and also [to] the majority leader." Related: McConnell Announces New Senate Sergeant-at-Arms The 114th: CQ Roll Call&apos;s Guide to the New Congress Get breaking news alerts and more from Roll Call in your inbox or on your iPhone.